Two companies have partnered to offer a new evening experience in Las Vegas. Visitors can now enjoy the Las Vegas late night food scene combined with a 15-minute flight over the world-famous Las Vegas Strip. 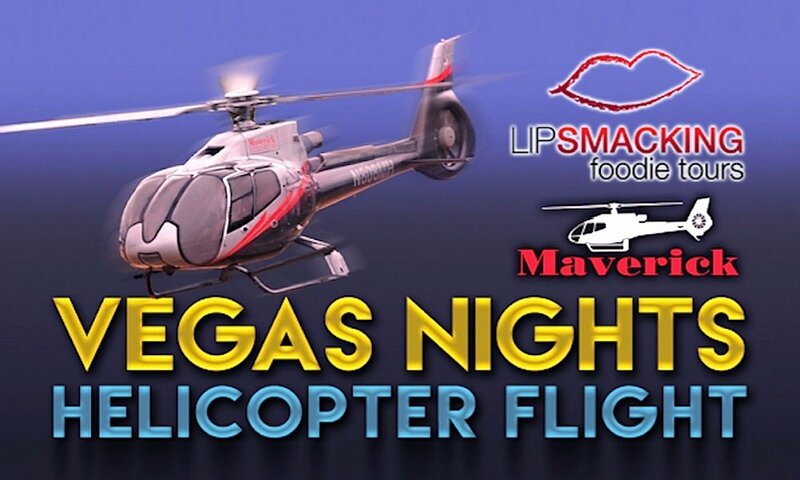 Maverick Helicopters has partnered with the top-rated Las Vegas culinary tour company, Lip Smacking Foodie Tours, to offer Savory Bites & Neon Lights, featuring an exclusive tasting at five prominent restaurants, followed by Maverick Helicopters’ renowned Vegas Nights flight over the Las Vegas Strip. The five-hour experience begins at 6.00pm at ARIA Resort & Casino and includes a guided tour to each dining venue, reserved seating and up to four signature dishes at each restaurant. Guests can expect to visit acclaimed culinary destinations such as Chef Michael Mina’s Bardot Brasserie, Chef Shawn McClain’s Sage at ARIA, and Chef Costas Spiliadis’ Estiatorio Milos inside The Cosmopolitan of Las Vegas. For visitors to Las Vegas this is an ideal opportunity to taste dishes from some of the most exclusive restaurants the city offers in a single evening. The tour host guides guests through the menu and the food that they are enjoying. After dining, guests are transported to Maverick Helicopters’ private Las Vegas terminal where passengers will be greeted with a champagne toast before their 15-minute Vegas Nights flight. Each helicopter offers panoramic views of the Las Vegas Strip with narration about the surrounding attractions. At the end of the flight, one of Maverick Helicopters’ limo coaches takes visitors back to their hotels. The Savory Bites & Neon Lights tour costs $299 per person ().